This year we are sending out a Summer Starter Kit™ to all campers who register for any 2019 summer session before January 15th, 2019. Show up to camp in style with the EXCLUSIVE 2019 Summer Starter Kit™ merchandise. 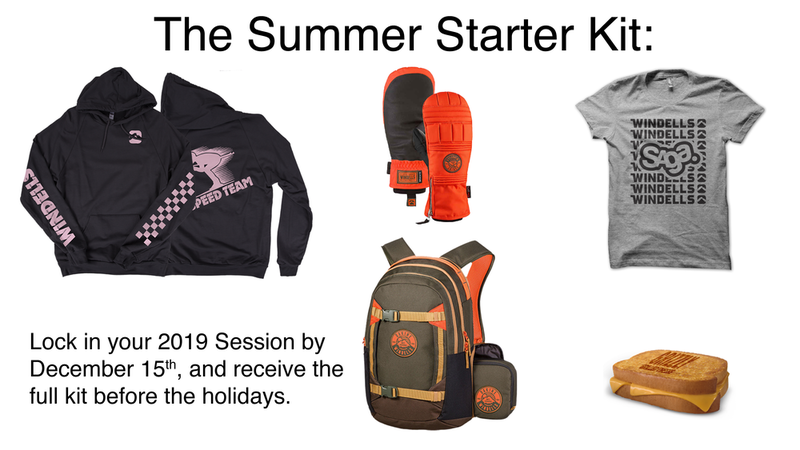 The Summer Start Kit™ includes a Windells Speed Team Super Fast Hoodie, Dakine X Windells Pointer Mitts, Dakine X Windells Mission Backpack W/ Lunchbox, Saga X Windells LTD T-Shirt, and a Grizzly Grilled Cheese Card. Want to give the gift of camp this holiday season? Register for camp before December 15th, 2018 and we guarantee that your Summer Start Kit™ will show up in time for the holidays.